1) Workcenter Role: This Role can be created , when we are looking to implement Portal according to customers needs. These roles can be called from backend i.e. 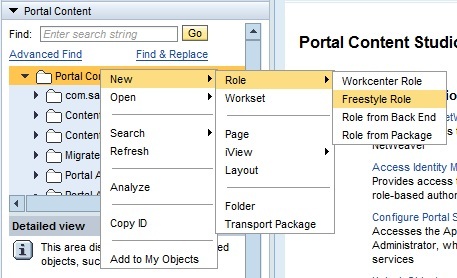 ECC PFCG roles, using Role Upload tool in the Portal. The content , pages and iviews that are created from this role can be reused in other roles but not vice versa. 2) Freestyle Role: This roles can be created or come from the SAP business packages or from other portal such as Share Point Portal or from the SAP Portal itself. 3) Role from Back End: This roles can be created or come from the backend system i.e. ECC. When there are few existing roles in back and the customer feels that there is no need to create any new roles in Portal , then we have to go for these roles. The name will be same as the backend role name. 4) Role from Package: This roles can be created when customers who are looking to integrate SAP business processes into the SAP NetWeaver Portal with SAP’s pre-defined content. This iview can be created or used when we need to call some application from the backend system. Specially for WebdynPro or BSP types of iviews.